Recently over coffee, my friend Anthony laid an interesting idea on the table – let’s be each other’s source of accountability for posting a blog each day. Him: Yes. And if there’s not a new post up by 5pm, let’s ping each other. He told me to think about it. 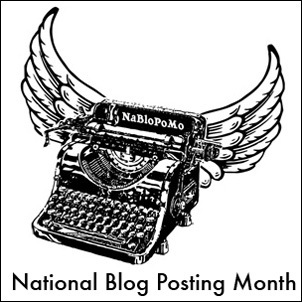 I’ve always been a fan of National Novel Writing Month (NaNoWriMo). I usually sit on the sidelines, cheering on writers who are brave enough to craft 50,000 words in a mere 30-days. The idea of pumping out a novel like that is exceptionally admirable and epic, but I’ve never participated. I’m a writer at heart, but being setting out to write a novel is very different. But one blog post a day could work. It’s less intimidating than NaNoWriMo and way more applicable to my life and goals at this time, yet still ambitious. I have this glorious, beautiful blog that deserves some contextual love. I have a lot to say, and I haven’t been saying it. Some big things have happened this year and more incredible things are happening before it finishes; I don’t want to let those go unnoticed. And most importantly, I’m doing this for me. My coffee buddy will be NaBloPoMo-ing along with me, and we’ll keep each other on track (you’re welcome to do so as well). My goal for this month is to become a blogging machine and stop letting that little voice in the back of my head get its way when it says, “you shouldn’t post that…” Goodbye writer’s sabotage and perfectionist’s doom! I have a voice and a blog for a reason; let’s do this. This entry was posted on Monday, November 1st, 2010 at 8:15 pm and is filed under on writing. You can follow any responses to this entry through the RSS 2.0 feed. You can leave a response, or trackback from your own site.